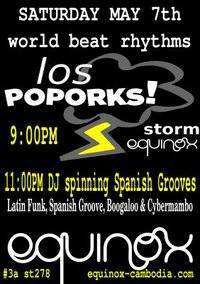 Los Poporks are back in town - one night only! Los Poporks are back in town – one night only! The ever excellent Los Poporks are bringing their charismatic asses back onto the stage in Phnom Penh’s expanded live venue Equinox Bar. Gig starts at 9pm and is followed by DJ Hector showing off some Spanish groove. More details available on the Facebook event page.